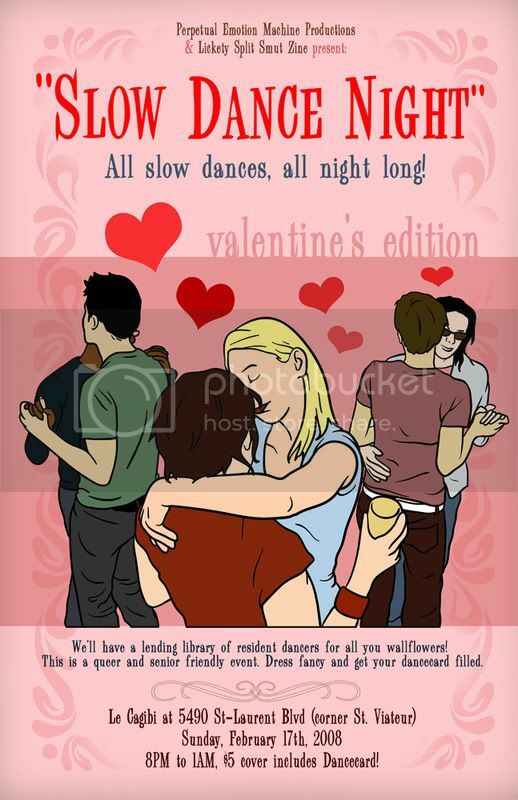 Slow Dance Night: Slowdance Night: Valentine's Edition on February 17th! Slowdance Night: Valentine's Edition on February 17th! All slow dances, all night long! We'll have a lending library of resident dancers for all you wallflowers! This is a queer and senior friendly event. Dress fancy and get your dancecard filled! Join us Valentine's Day weekend at Le Cagibi (5490 St-Laurent Blvd., corner of St-Viateur), Sunday February 17th at 8pm. $5 cover charge includes a dance card.